We are under attack. An unidentified alien mechanical species has breached the hull and is entering the shuttle. We need to place our defenses now. 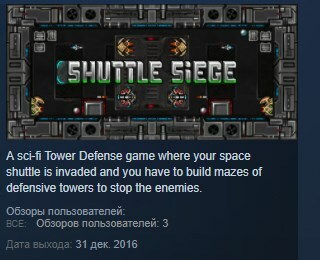 Shuttle Siege is a sci-fi Tower Defense game in which you defend your space shuttle from the invasion of metallic creatures. It distinguishes itself from classic Tower Defenses in that you can design a path for the invaders using your buildings, an aspect that very few games have (including Desktop Tower Defense and Fieldrunners). Challenging maps, powerful towers, and various types of enemies are going to give you a fun, fresh experience.